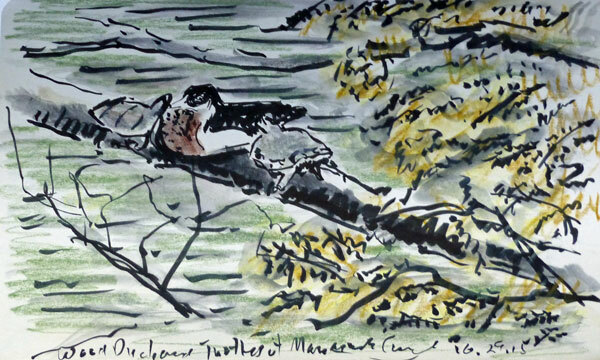 Male Wood Duck with Turtles on Log. Sumi Brush Pen Field Sketch by Ken Januski. I wish I had been there but I was not and once again I missed the opening of 'The Natural Eye', the annual exhibit of the Society of Wildlife Artists in London. Examples of some of the work can be seen online at What's On at The Mall Galleries. If you go to page four you'll see my two works. I thought this year was finally going to be the year that I and Jerene were able to visit the exhibit and meet other artists but it just wasn't possible. As I've said previously it is the only wildlife art exhibit that I find exciting. The link above gives you a very good representation of the work on exhibit and a very good representation of the type of bird and wildlife art that I like. Finally yesterday I was able to do some field sketching along the Manayunk Canal. I was hoping that a heavy storm the day before might have brought some unusual birds. But if they were there I didn't find them. I had however recently bought a sample pack of brush pens from jetpens.com because I've been so happy with the Kuretake Sumi Brush Pen that I bought there. I also wanted to try some of them out. A few are far too fine and stiff for my purposes. But others have a fluidity and flexibility that I like. An example of one of the pens is above. If I recall correctly it is a Pilot Brush pen. When I got home I added color with Caran d'Ache NeoColor II water-soluble crayons. I then used a waterbrush to make washes from the crayons. I know this sounds like an advertisement for these media, and you can certainly find plenty examples of such online. But that's not the case. I'd call it more objective reporting: these are the tools I used. In almost all cases here they are not the best tools but the best convenient tools. I could have used a sumi or watercolor brush along with watercolor. But that's less convenient, especially when out in the field, and unsure of whether or not I'll sketch. These tools allow me that possibility while carrying very little gear. Great Blue Heron, European Starling, Northern Cardinal. Sumi Brush Pen Field Sketch by Ken Januski. Above is another example of brush pen field sketches. On the right is a Great Blue Heron up in the trees also done yesterday along the Manayunk Canal. It's done with the Pilot Brush Pen. I also used that pen for the European Starling seen from my studio window. Above it a drawing mainly from memory of a Northern Cardinal that appeared momentarily in front of the same window. The Zebra brush pen was far too fine and stiff for my tastes, but others may love it. I guess it depends on how you plan to use it. In any case it's nice to be doing field sketches again and I'm happy to be experimenting with these various brush pens. Winter Wren in Leaves. 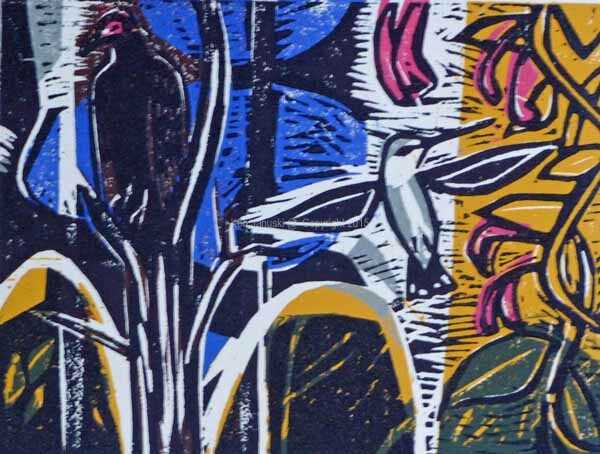 Proof of Combination Woodcut/Linocut by Ken Januski. Finally I'm continuing the combination woodcut/linocut of the Winter Wrens in Leaves. 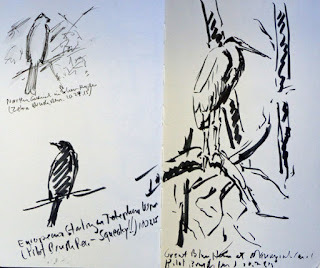 I've printed the black(Caligo Safewash Ink) on good paper(Shin Torinoko Cream). The black is from the old linoleum block. I then printed an orange on a woodblock on top of that. This is a proof. I didn't rub the baren as hard as usual because I was afraid the black ink might not be completely dry. As a result you can see that the orange is spotty. It may also be a bit darker than I want. But I do like the brown that results from printing orange(Daniel Smith Water-soluble Ink) over the black. Once I've printed the orange for the edition I'll cut away some of the black and print what remains on top of the orange over black. Easy as Pie as they say. Ruby-throated Hummingbird, Turkey Vulture and Trumpet Honeysuckle. 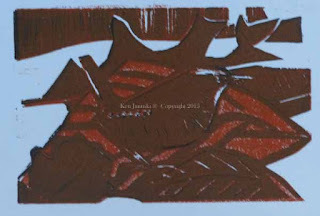 Completed Two-Block Reduction Woodcut by Ken Januski. I'm happy to say, and happy for you to see, that I can once again import pictures into this blog. I'm not sure where the problem was but I'm happy to say that it's fixed. And I'm sure anyone who dislikes my digressions into politics, while I waited to be able to post pictures again, is too. 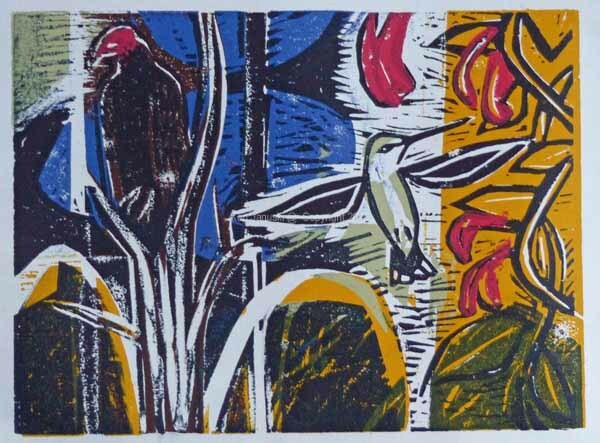 I finally finished the two-block reduction woodcut of the Ruby-throated Hummingbird, Turkey Vulture and Trumpet Honeysuckle above. A combination of needing to allow ink to dry on earlier prints before adding new colors as well as the difficulty of making the final decisions on where to cut and where to add the black made it a lengthy print. All I can say by way of explanation is to paraphrase Matisse who said that every single part of a picture is important. You change one and the balance of all the others changes as well. So when you finish a painting you're saying this is the best I can do. No more changes. I have to say that, at least at the moment, this is my favorite woodcut or linocut of all that I have done. Each day I look at it in the studio I'm pleased and it seems like it was worth all the work and all of the delay. Winter Wren in Leaves. Proof of Black over Orange Over Black. 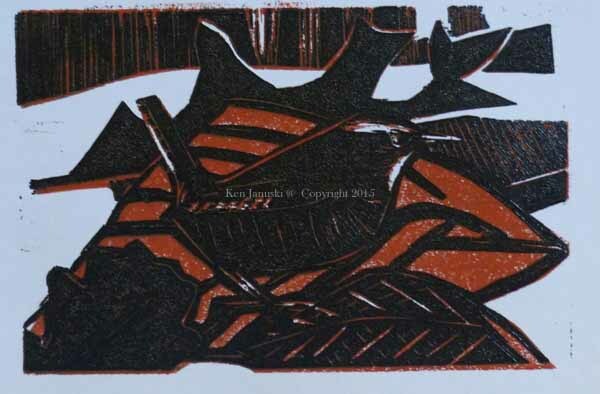 Combination Woodblock and Linocut by Ken Januski. But there is a problem that has been lurking on the horizon with my printmaking. That is the end of manufacturing of the water soluble ink I've been using for a couple of years, Daniel Smith. I'm not sure that other media have such basic problems, like even being able to buy the tools you need. Perhaps they do and I've just never run into them. I know I certainly haven't while painting in oil, acrylic or watercolor. I began using oil-based inks. I liked the results but didn't like the need for petroleum based solvents, both for health and environmental reasons. So I experimented with water-soluble inks. But the two I tried, Caligo and Akua, just didn't seem to work the way I wanted, at least in m brief experiments. The only other water-soluble ink I know of is Graphic Chemical and I have heard no reviews of it. So after I finished the print at top I asked on the Facebook page of Friends of Baren if they had any ideas. All three inks had their following. So I thought about trying the old Caligo ink I bought a few years ago. 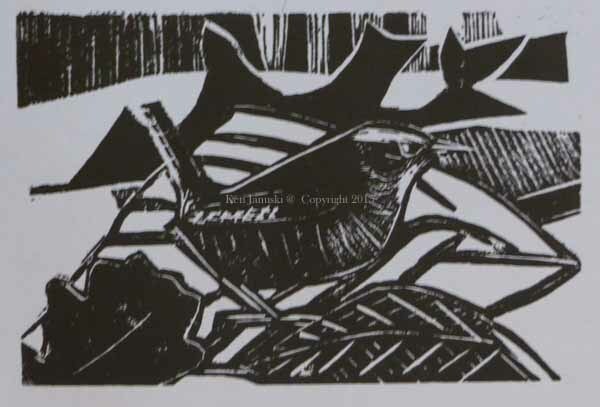 My old linocut of a winter wren in leaves seemed a perfect candidate. I was happy with the edition when I printed it but I felt the wren disappeared a bit too easily. I also thought that an orange and/or brown could be added and really bring it to life. So I decided to experiment. I proofed the original lino using Caligo black ink, as seen below. 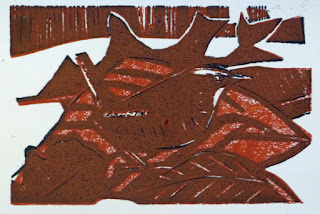 Then I copied that onto a woodblock of the same size, cut the white areas away, and printed orange on top of the black. The results can be seen at the bottom. I did this just out of curiosity and was pleasantly surprised at the brown that resulted from the orange overprinting the black. So in the proof at top I've printed black on top once again. I like the results. I've lost that brown but my plans are to eventually cut some of the black lino away so that some of the brown shows through. If it works as planned this will be a shockingly simple print, the complete opposite of the last one. Of course that is refreshing. And I like them both. There is a place for the simple, the complex and the ambitious. I tend to favor the latter but it's always refreshing to try the former. Winter Wren in Leaves. Linocut Proof by Ken Januski. Winter Wren in Leaves. Linocut and Woodcut Proof of Orange over Black by Ken Januski. Well I'd like to show the finished print of the Ruby-throated Hummingbird and Turkey Vulture but Blogger won't let me upload photos, though it does pretend that it is doing so. I'm not sure if this is a Blogger problem or perhaps instead a result of Windows updating to Version 10 without my permission yesterday. In either case I can't upload photos, or more precisely I can't import them into my blog. So it seems an opportune time to mention something I've been thinking about. Having been a member of a union during the many years that I worked at a newspaper I have some experience with them. And all in all I'd say that the average American is worse off due to their decline over the last 20 years or so. That's not to say that they didn't have their problems, including use of goons, violence with some of the more forceful unions, and most noticeable to me protecting members that really were only a burden on everyone else, both other union members and management. But all in all my experience was good. And I do have to wonder if there wouldn't be a healthier US middle class if they were stronger than they are. The reason I'm even thinking about them is that in the case of most newspapers over the last 10-20 years both unions and management have actually, at least at times, had the good sense to drop the rhetoric and work together. The reason was simple: survival. Both sides knew that they were in trouble, with declining readers and more importantly declining advertising revenue. So, again within limits, they worked together for their own survival. They didn't try to blow themselves up. And then there is The Freedom (From Intelligence) Caucus of the House Republican party. They don't seem to have common interest with anyone so nothing worries them, much as if newspapers and unions both held their ground and just stopped publishing. But they had the good sense to know that they'd die if they didn't publish. That good sense seems missing from The Freedom(From Intelligence) Caucus and its supporters. They make me think we must be the laughing stock of the world. I should add that I can't really say a whole lot for the Democrats either, but at least they are not trying to self-destruct. Ruby-throated Hummingbird and Turkey Vulture. 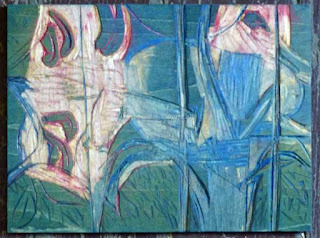 Late Stage Proof of Two-block Reduction Woodcut by Ken Januski. I'm down to two proofs now. 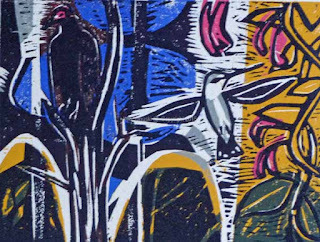 That is the number of test proofs I have left in order to continue to proof as I finish off this two-block reduction woodcut of the Ruby-throated Hummingbird and Turkey Vulture along the Manayunk Canal, seen about a month ago. For anyone unfamiliar with reduction prints the photo below might be illuminating. As I print each color I either carve it away so that it can't be printed or proofed again, or I cover it with another color. In any case once a color is done it is completely done. So above I printed the yellow first. But at this point there is no way to print it again. If you look below, at the left side since it prints in reverse, you can see that there is almost no wood left. It's all been carved away. You can see the few raised aras where I printed the newest rose color. When I start such a print I begin by printing numerous proofs. So for instance I started off with between 16 and 24 proofs of the yellow. As I experimented with other colors I proofed them, When I printed a configuration I was happy with I proofed the remaining proofs in the new configuration. But each failed experiment, or experiment I decided against, is a proof that can't be continued since it no longer looks like the print. The number of proofs gets smaller and smaller as I go on. Now I'm down to just two!! That means that if I decide to keep the rose color above and print as is I'll still only have two proofs left to test the final black color and any other last minute changes I'd like to add. Those will be minimal at best because as you see below there's almost no wood left to print on the color block below. 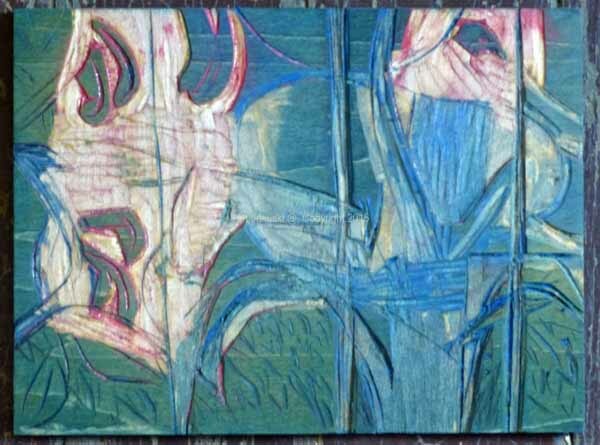 Color Woodblock of Two-block Woodcut Blocks. Photo by Ken Januski. Nonetheless I'm happy with this. It will change a bit from the proof at top in that I'll print black on top of the new rose color rather than the opposite as I did at top. I only did that because I'm so low on proofs and I knew that the rose area was so small that I could proof this way and still get a good idea of the final results. In many ways the rose is the most important area of print. 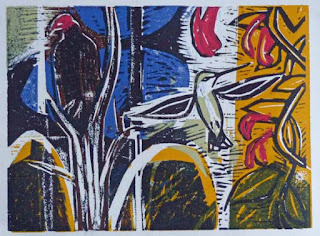 All along, ages ago when I started this I hoped that the rose of vulture's head and honeysuckle would unite the print. And yet I couldn't print them until near the end since they were such small areas. So all along I haven't been able to test what they might look like. I just had to hope they'd look okay when I finally got to this stage. And I think that they do. Something else looks okay, maybe even better than okay. That is the online gallery of much of the work, including my own of the 52nd annual exhibit of the Society of Wildlife Artists, The Natural Eye -2015. If you scroll down to middle of page to the 'Featured Artwork' section you can see 10 pages worth of fantastic art that will be in the show. My own work is on the fourth page. I'm sure any readers that continue to read this blog realize that I often spend time flogging the dead horse of much wildlife art, especially that based on photos. 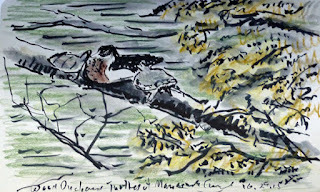 As a positive answer to those who disagree I always point to this show, a fine example of vibrant, lively wildlife art!